On Monday, the Kolasib NGO coordination committee served a quit notice to Dr T Arun, district election officer, accusing him of adding Bru voters without proper hearing and incomplete documents. Life came to a complete halt in Kolasib town on Wednesday after the NGO Coordination Committee of the Kolasib district organized Save Mizoram Movement demanding the ouster of DC and district election officer Dr T Arun over the alleged inclusion of 218 Bru voters in the latest electoral rolls. The Kolasib Joint NGO coordination committee in a statement issued Monday night has served the election officer an eviction notice which they demanded he should comply with latest by 5 pm on Tuesday evening. Adamant Dr T Arun said that he had done everything under the guidelines of the Election Commission of India norms. Thousands of volunteers on Wednesday staged demonstration in front the DC office and volunteers of the NGO Coordination Committee burnt the effigy of Dr T Arun. The protestors displayed placards and banners demanding an immediate ouster of the DC. 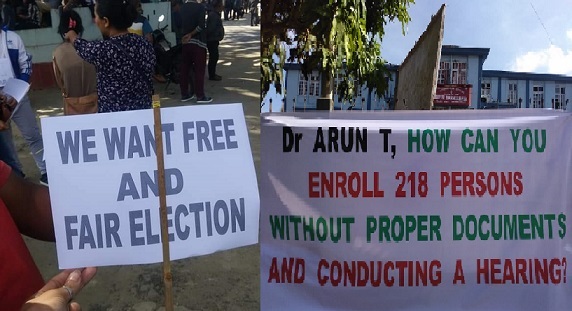 Earlier the NGO Coordination Committee has lodged a PIL at Gauhati High Court saying that Dr T Arun had added 218 new Bru voters, which were rejected by AEROs who cited incomplete application. The district election officer following appeals included these 218 new voters without any hearing. The Gauhati High Court is expected to call a hearing later on Wednesday. “The district election officer had added 218 Bru voters and these added voters are residents of the relief camps in Tripura, and we have learnt that they were added to the rolls without any proper hearing by the district election officer Dr T Arun,” the NGO coordination committee said. The NGO’s statement also said that repeated requests were made to the officer to conduct a proper hearing at the Bru relief camps if he was to add new Bru voters in the roll. The Bru imbroglio in Mizoram has led to the ouster of Mizoram CEO S B Shashank and Mamit Deputy Commissioner Bhupesh Chaudhary. Shashank was alleged of taking the Bru sides and seen as the culprit for the exit of Lalnunmawia Chuaungo. The NGO Coordination Committee has made a brief statement this afternoon saying that the protest would go on until the names of 218 Bru voters are deleted from the electoral rolls and Dr T Arun leaves Kolasib. The committee is also contemplating a bigger demonstration on Thursday. They said that schools in Kolasib would be closed on Thursday along with all other government institutions.